We stock Parker Interchange pneumatic fittings, which include plugs and couplings. The Parker Interchange couplings consist of steel locking balls, NBR seat and stainless steel springs. High performance coupling, field-tested and long-lasting when used with pneumatic tools.Pressure rated at 250 PSI and temperature range of -4 to +176 degrees. We have a large inventory of Parker Interchange pneumatic fittings including couplings and plugs. 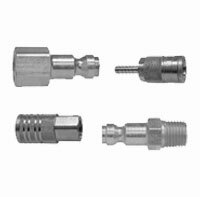 We also carry a full line of stainless steel fittings in various sizes, alloys and end types. View our full line of stainless steel tube products. Our Parker Interchange pneumatic fittings are available in multiple sizes for all of your pneumatic fitting needs. For more information, view our dimensional data. We stock a variety of Parker Interchange pneumatic fittings in many specifications. Parker Interchange pneumatic fittings temperature range is between -4 and +176 degrees. This is a field proven coupling and plug. The Parker Interchange coupling and plug are very durable and long lasting. Applications include pneumatic tools and other.